Commerce, with only 2 e’s please! We’ve all heard the stats and we don’t need them to tell us: we all prefer to buy in our own language. In fact according to the E.U., 2 thirds of E.U. 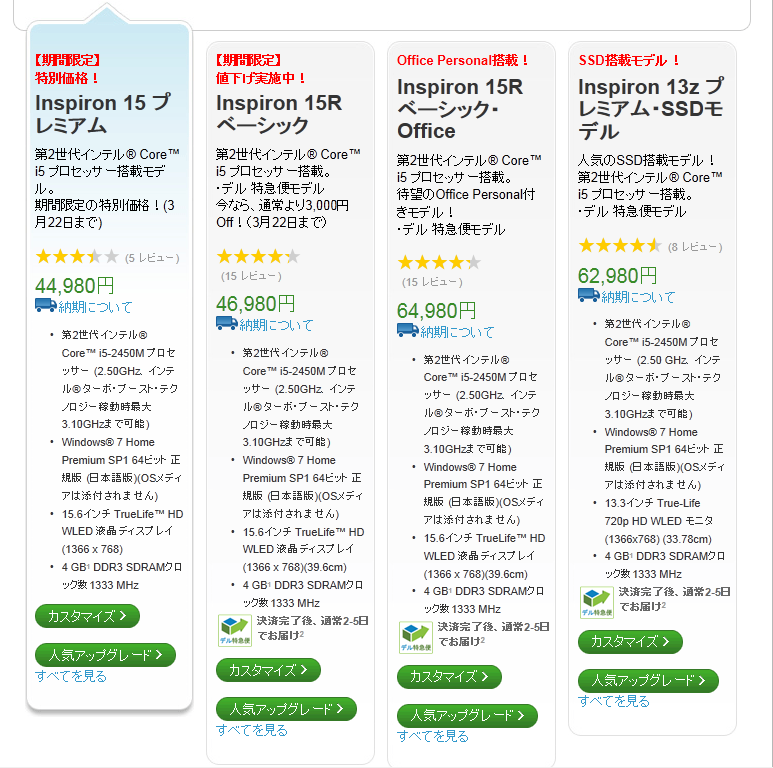 web shoppers will simply not buy in a foreign language. Yet, we also like to shop online because there is more choice, better value and the facility to easily compare alternatives. The key is that we value a personal touch at the time of the transaction. By transaction I mean not only the financial aspect but also the decision process and the post-sale relationship. This is why the “e” in eCommerce is about to drop, and Commerce is being rethought as an integrated or omni-channel experience. Models like Personal pick-up where you purchase online and pick-up in-store, Cash On Delivery where you only order online and pay on delivery and Try it on before you buy where you simultaneously shop in-store and purchase online, must all be seen as equal-opportunity conversion channels. Simply said if someone, somewhere is interested in a product you have on offer, you need the tools to make sure they end-up buying yours, whichever way they prefer. The fact that people are naturally inclined to complete purchases in their native language can be an even bigger challenge in Europe. Contrary to what institutions are aiming for, Europe is not a single market. Europe is a conglomerate of countries which do not speak the same language, do not have a single culture or a strong common identity and where in truth people do not think of themselves first as European. This has a very real impact on any pan-European Commercial strategy. The economies of scales you could expect from a 505 million strong E.U. population (and over 740 million in the whole of Europe) simply do not simply materialise as soon as you decide to sell across Europe. The European Union has 24 official and working languages; it needs to employ 1,750 linguists and 600 support staff, and has one of the largest translation services in the world. No one can communicate in Europe with one voice, much less one language. This cultural, political and social diversity explains a lot of the differences in international expansion between U.S. and European companies. A European company is more likely to look at expansion into other territories as an incremental process rather than a full-on Globalisation plan. This is compounded by complex practical considerations such as preferred payment methods, shipping options, local regulations including language laws, customer service requirements and return policies. These are equally a challenge to European and non-European businesses wanting to sell in Europe. But European companies are more aware of them, and they can be more to prone to tackling them methodically one country at a time, rather than creating Global Departments in charge of each aspect or even outsourcing to local partners. Plus there are the Locals: what makes your offer more compelling than the existing national businesses in the first place? This is a paradox where more people, more languages and arguably more cultural diversity can result in companies appearing less prepared to invest in Enterprise Language Solutions. Lower economies of scale and a lack of clear path to expansion are the blockers. Europe also has an overwhelming proportion of businesses which are Small and Medium Enterprises and employ a very small number of people each: 90% employ less than 10 people according to the Harvard Business Review blog. This means European companies who want to expand outside their national territory and have the most localisation needs are SMEs. Sometimes referred to as the Nano-Multinationals, these would-be giant slayers do not behave like Multinationals or their local subsidiaries. They have to expand from the ground up, more progressively and often excel at figuring out smart ways to do things themselves. Their expansion is not likely to be backed by a multi-year globalisation budget. It’s a bit like the stereotype of the American tourist versus the European one: the first allegedly does Europe in a week, while the latter often prefers to settle somewhere and get to know the place. It doesn’t matter which is right (if any); if you work in tourism you have to account for that fact and adapt your offering to each one of them. 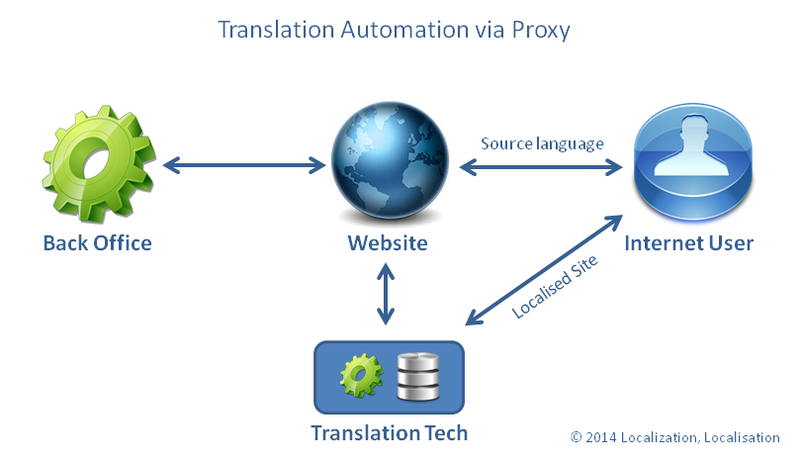 Providing Translation Technology to multinational SMEs requires a specific business model. The Translation Technology business model needs to adapt in order to respond to the needs of European businesses. Access to automation must have an easier entry-level, and I don’t mean a low-cost solution involving Machine Translation or Crowdsourcing. True, MT has evolved a lot and has proven capable of being a very effective technology, like Translation Memory has been. Crowdsourcing itself has had great results for organisations such as Twitter and multiple others. But in the case of International Commerce the answer is not cheap tricks, it is scalable automation. Clouds are not too popular here in Dublin, where I live. We see enough of them as it is, so you won’t get a diagram featuring a computerised fluffy cloud from me (no more than you’ll get a 140-character post). I do however want to talk about Cloud-based Translation Technology, or more precisely Software-as-a-Service as an essential enabler for eCommerce in Europe. 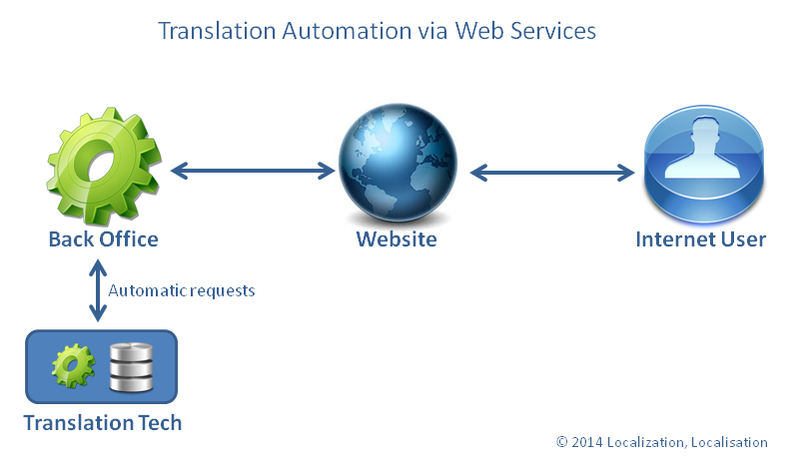 There is no longer a need for translation buyers who want to automate to own translation technology. With web applications like the GlobalLink platform (TransPerfect‘s GMS) for example, businesses of any size can access tailor-made solutions which are able to adapt and grow as their International Expansion gathers momentum. These applications can be accessed via any web browser and from various devices without having to install anything. They feature optional Modules so each user only gets access to what they need. Plug-ins are even available so content can be sent to translation and deliveries received directly to and from eCommerce platforms such as hybris, DemandWare, Magento or EPiServer Commerce etc. without the need for complicated middleware deployment. Any security and practical concern around renting online technology in general has been allayed through stringent auditing processes and extensive deployments of SaaS solutions across the entire I.T. sector. In fact in the case of Translation technology, it is clearly an improvement over FTP and emails based processes as well as traditional on-premise TMS applications. It provides seemless Software upgrades, dedicated IT infrastructures for hosting, audited disaster recovery procedures and automated back-ups, without any effort on the part of the user. It is now the sensible choice to rent Translation Technology as a Service and very much the exception to buy and install a TMS on-premise. In the case of GlobalLink it also allows for the flexibility to continue using preferred local translators or in-house resources and local distribution partners as language providers. Alternatively existing Subject Matter Experts can be promoted to a role of Language Quality partner (collaborating to the maintenance of brand & style guides, and glossaries) so the increase in translation volumes does not end-up affecting their primary functions which are usually Sales or Marketing. One more level of flexibility exists where Translation Technology customers can choose between connecting the SaaS solution directly to their back office or using it as a Proxy between the internet users and their original website. This choice is more strategic than technical. In the first case the business continues to manage their translated assets in the back office like their CMS, eCommerce platform, PIM etc. With the proxy approach, the business can outsource the entire localisation effort using a solution like GlobalLink OneLink which provides not only all the linguistic services and automation but also the engineering, QA, international SEO and maintenance. The overall result is that companies of all sizes can support their international expansion efforts with translation automation which can evolve with the company’s eCommerce strategy. Over the last few years, the number of Globalization Management Systems (GMS), Translation Management Systems (TMS) and similar Workflow technologies dedicated to Localisation has increased steadily. It is not quite comparable to the explosion in the number of Content Management Systems (CMS) but the choice certainly has increased. As a result it has become more complicated to thoroughly evaluate all options available, and the rise of more specialised subcategories such as Localization Management Systems, Proxy and Cloud-based solutions, Crowdsourcing Portals etc. only adds to this information overload. This evolution indicates that this technology sector is vibrant and not yet as saturated as the traditional CAT tools market. It remains innovative and in my opinion contradicts analysts who argue that GMS’s will be absorbed by CMS’s and the booming eCommerce platforms. In fact, there are so many CMS’s and eCommerce solutions around, from the big players such as EpiServer or Adobe Experience Manager (formerly Adobe CQ) to open-source solutions like Drupal and proprietary systems provided by website integrators, that there is no way these can be relied upon to provide workflow features which can respond to the specific requirements of the translation supply chain. The GMS sector has also become more of a replacement market, where Enterprises are often looking to replace an existing GMS with their second or third technology. A certain lack of innovation, excessive licensing costs and mergers among some of the traditional big players have created an appetite for diversity and an opportunity for innovators. There are certainly some interesting new technologies. Some focus on the User Interface and the easy-of-use, others on community with in-tool forums for users to share tips and experiences and real-time Support to keep production streaming. Others yet allow segment-level task completion and embedded MT to enable real-time progress. Most, if not all of these efforts seem to concentrate on improving ownership satisfaction which has long been a shortcoming of GMS’s. Unfortunately, fundamental GMS features can sometimes be lacking when these tools are released at an early stage in their Development, or when their design is not aware of the requirements of the entire supply chain. Prospective GMS-buyers should not get distracted by the bells and whistles, and miss possible issues with the more essential features. The 10 fundamentals below should be your starting point and the rest should only come as extras. The order of priority between these will depend on your own business process. Workflow systems are used by Enterprises which have a regular stream of translation requirements. Vendor rates are usually pre-agreed rather than negociated on a project by project basis. The Workflow technology should be able to hold these rates and automatically generate a quote when a translation request is submitted. It should be able to handle minimum charge, PM fees, volume discounts and provide a workflow step where the requestor or authorised user can accept or reject the quote. Ideally there should be an online translation interface as well as the option to download translation requests and work offline. The online interface should include enough features to ensure it can be used by professional translators: Spell-Checker, Tag Checker, Terminology Checker, Concordance Search are the minimum required. The offline option should be vendor-agnostic and offer XLIFF as well as the bilingual formats for the main CAT tools such as WordFast, memoQ and Trados. The ability for these tools to connect to the online TM and Glossaries and update them in real-time is also expected more and more commonly. A library of CMS and eCommerce adaptors should be available. GMS’s such as GlobalLink provide a library of connectors for the most common systems as well as an API to create connectors for new CMS and eCommerce platforms or proprietary systems. There should also be the possibility to monitor FTP locations and file systems. Client review or independent linguistic review is common in translation chains where volumes a big. This is mainly due to the fact that big volumes mean multiple translators must work simultaneously, and the Review step is needed to enforce consistency and monitor quality trends. A dedicated Online Review environment can make this process immensely more efficient if it’s kept clear and free of the more specialised features required in the Translation Interface. Client-side reviewers are rarely linguists and more likely employees whose primary task is brand and marketing related. Live in-context preview is more relevant to them than a side-by-side segment layout. The Review environment should have its own reporting tool to monitor quality if error categories and scores are used. Reports on individual projects (online scorecards) and Organization-level reports are equally as important. The system should keep an audit trail of changes, and offer some workflow functionality towards Implementation whether it is done by the reviewers or by the translators. Changes implemented in the review tool must be automatically added to both the final deliverable and the translation memories. Most file types will be supported out-of-the-box but it is also crucial to have the ability to easily add future or unusual file types without having to resort to Professional Services. The file filter interface must be flexible and allow Administrators to import filters from CAT tools but also create filters online in the GMS. I have yet to see a tool, let alone a GMS, which does that as well as a Alchemy Catalyst and its EZparser but hopefully that day will come. In the meantime do not settle for a system that wouldn’t let you parse all tags in a JSON or other custom XML and ensure post-filters are supported (e.g. for HTML code nested within XML or XLS). A good GMS will let users with appropriate permissions perform all TM and Terminology set-up and maintenance tasks natively. This includes manual editing of both asset types, TM sequencing (with leverage priority, penalties, update TM selection), workflow-driven automatic updates, terminology extraction and approval. All users need the ability to search TM’s and Glossaries, while only experts will get the permissions to perform Maintenance. 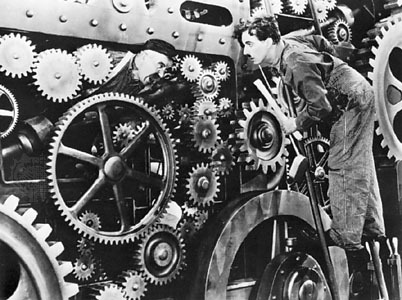 The key to workflow management is automation. Clicks are a GMS’s worst enemy and should be a primary focus during User Acceptance Testing. Any repeatable task should be recorded and automated. The requestor should not have to type anything other than the project name. Everything else should be available through menus and selectable options, each with the most commonly used choices pre-populated. Ideally, the software should interactively learn and remember the behavior of each user, but pre-programmed defaults are the current standard. There should be a choice of download formats, and a way to create custom reports based on queries to the underlying database. Client-side users don’t always need visibility into the linguistic side of the system. What they do need is flexible on-demand reporting. Whether there is a live dashboard or a facility to run reports, the system has to be customisable so the reports respond to their Organization’s needs both from the point of view of Program Management and Financial tracking. The pricing should not be directly linked to the number of users. I have often come across Enterprises with state-of-the-art workflow systems where the vendor side PMs had to download and upload translation kits on behalf of their freelancers. The hidden cost of such a limitation is monumental and the amount of negative sentiment generated towards a system which is supposed to automate repetitive tasks cannot be recuperated. Role-based permissions should allow Administrators to control what everyone is doing at a granular level, and all routine user assignment should be automated. Once you own a GMS, every single transactions must be seamlessly supported, and no one should ever have to be delayed by timezones. Localization workflows vary. The technology you choose should offer enough flexibility to support your business process without too much adjustment. The Workflow Designer should offer a customisable library of human and automated steps and the possibility to have more than one outcome to each workflow step (e.g. Pass/Fail, DTP/no DTP etc.). The best Designers have a graphic interface and allow the easy cloning of existing workflows. The Report Center was completely upgraded with the last major release of WorldServer. Overall the new offering was very good, with a more modern interface and a more powerful underlying technology. Yet upgrading the Report Center and starting to make the most of its full potential required a certain amount of effort. This is mostly because while it is accessible through WorldServer, the Report Center is in fact a completely separate application. Moreover, it is made-up of three distinct elements, for which no integrated documentation exists: the queries, the reports layout and the repository site. This post reviews the basic functionality of the current version and suggests ideas to improved it in the future. Add Version Control and Roll-back functions for successive uploads of the same JRXML. This is essential since the queries and layout cannot be edited via the Report Center. Automatically read the Report Name and Resource ID from the JRXML file, to save manual steps and prevent typos. Batch JRXML upload: this would be very useful to support upgrade effort, as well as to transfer reports from a Test server to a Production environment. 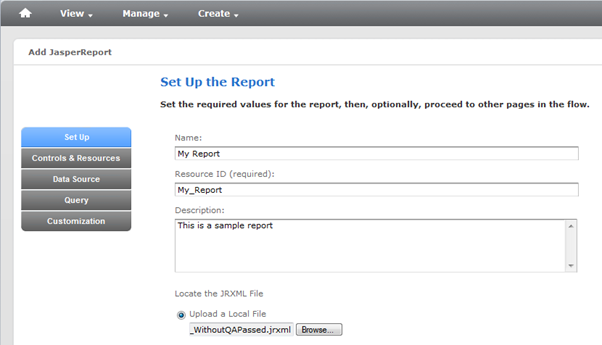 Finally some editable JRXML samples should be provided to show users how JasperReports can be used in WorldServer. Next, each Report has to be connected to a database. The setup steps may differ slightly depending on whether WorldServer uses Oracle or SQL, and drivers may need to be installed. Here again, there is room for improvement in my opinion. The possibility to connect a location within the Report Center to a database would be helpful. Instead we have to connect each report one at a time. User access can be managed at both user or role-level. You can also setup different access for each report separately or for a folder within the repository. This is in keeping with one of WorldServer’s strengths, where permissions are extremely flexible, and relatively easy to fine-tune. You could for instance have some reports only visible to Project Managers and others to Language coordinators. You could show linguists reports where the data only relates to their own work, or create Customer or Business Unit specific reports and then only grant access to them to people in selected groups. Permissions can be edited by right-clicking on a report and choosing Permissions. Roles and Users are accessed via the Manage menu. A dialog box can easily be created to allow users to filter their searches or, more precisely, to set up the value of parameters to use when the report runs. In an SQL-based setup, percentage signs can be used for wildcards. A parameter added to the report during layout design is associated to each Input Control setup in the Report Center. Note: the parameter name must match that from the Jasper Report (case-sensitive). 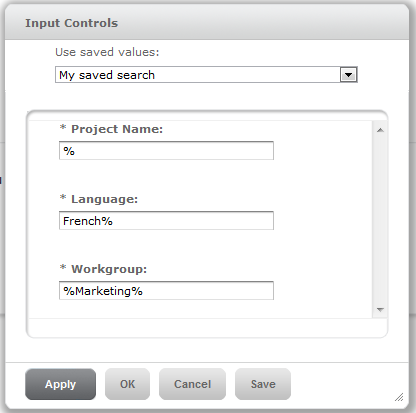 A Report can have several input controls, so the user could for example set a value for Project Name, Language and Workgroup themselves, before running the Report. The Input Controls dialog also lets you save commonly used search parameters. Overall this too works very well and is also relatively easy to setup. My only criticism is the lack of documentation: there is no Online Help or Report creation guide apart from the Samples in the View menu. The layout of WorldServer Reports cannot be designed or changed from WorldServer. 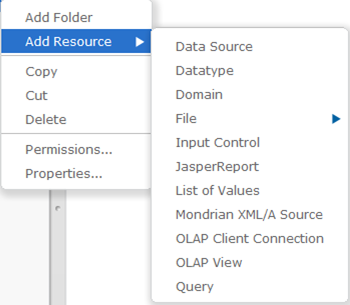 The best way to do that is to embed your SQL query within a Jasper Report (.jrxml) using the JasperSoft iReport Designer. There is a free version available for download, which provides everything needed to design a WorldServer Report. Once again though, there doesn’t seem to be any WorldServer-related documentation available. Go back to the Designer and drag 1 or more fields from the Report Inspector into the Detail area. This will automatically create headers which you can then rename, align etc. It can be time-consuming to pretty-up reports in iReport. The first way to gain efficiency is to make a choice between the way they look online and how clean the exports are. If you expect your users to consult the reports online, you may want to spend time making the report look good online, and load fast for example by breaking the output into pages. By opposition, if you expect the reports to be downloaded and their data further manipulated in Excel, you should instead make sure that the output doesn’t have empty lines or columns. Edit the Fields, Descriptions, and Parameters which need to be changed in the layout. The query viewer in iReport is useful to a point but it doesn’t provide much feedback regarding syntax errors or other issues in queries. Another big limitation is that it doesn’t give any visibility into which Tables and Views are available in the database. If your WorldServer uses an SQL database, you should consider using SQL server management studio when writing the queries. You can create and test your queries there before copying them to iReport, and browse through the database to get familiar with how the data is structured. One thing to remember is that active and completed projects are in two separate locations. Just like in WorldServer you have a view for Active projects and another for Completed and Cancelled Projects, under Assignements, the database has the latter in dbo.archive Tables, and the former in dbo.active Views. Performance is much better when querying active projects, and the way the data is structured can also differ in the two locations. You must have a very clear understanding of the following 3 WorldServer concepts. Their ID numbers are essential within queries because they link information associated with each of them. For example the language name is Project data, but the current owner is Task information. The 2 will need to be joined in order to create a report on current Task owners which lists the languages. Lastly, any search parameter is better created directly in iReport once the query is finalised. Just replace them with an arbitrary value for testing purposes while working in the server management studio. There are plenty of tutorials available for beginners and less-experienced database users, and a lot of them are free. I found SQL course.com very clear and concise. The interactive SQL interpreter is great for practicing and experimenting safely. W3Schools is another very good resource. Transcreation is used in high visibility content on Dell.com. In this example, the French banner has a more seductive tone, and replaces "Shop Now" with "Discover More"
Last summer Wayne Bourland, Director of Global localization at Dell, spoke about Machine Translation at the LocWorld Conference in Barcelona. He raised some very interesting points, which were later echoed in an article in MultiLingual (July-August 2011). The central idea was that MT was failing to gain traction for three reasons: clients not knowing how to buy it, Providers not knowing how to sell it, and Translators being reluctant to support it. Wayne is an active member the Global Localisation community. He has been involved in developing best practises in the industry, sharing experiences with other Localisation consumers and developing sophisticated partnership with providers. He has now accepted to revisit these ideas with us and discuss the outlook for MT. We’ll also take this chance to talk about other aspects of Localisation, such as Translation Management Systems and Translation Technology in general. [Nick] Hi Wayne, thanks very much for agreeing to give some of your time to talk to Localization, Localisation. Could you start by giving us an overview of your career? [Wayne] I came into this industry in an unconventional way. After a decade in the US Army I joined Dell, starting as a phone tech support agent. After moving into management I helped to establish call centers in India and South America before making a jump over to managing writers for support content. We had a small translation operation supporting tech support content in 7 languages. After being asked to take over the translation team we grew the team rapidly, moving into online content, then marketing, to where we are today supporting more than 90 different groups across Dell. Now let’s start with MT. Does MT still get more talk than action or have you observed an evolution in the last year? Has your team been driving changes in this area? I think we are certainly seeing a groundswell. Jaap van der Meer with TAUS used to talk about 1000 MT engines, now he talks about 10s or 100s of thousands of them, trained very quickly and supporting a multitude of languages and domains. Every major client side translation leader I talk to is using MT in some way. Some are still toying with it, but many are investing heavily. Vendors have caught on to the growing demand and are either building their own capabilities or forging partnerships with MT providers. We are seeing groups from academia starting to see the value in commercializing their efforts. Soon we may have the problem of too much choice, but that’s on the whole a positive change for buyers. As far as the role my team is playing, we are doing what we have done for years, representing the enterprise client voice, discussing our perspective wherever we can (like here). 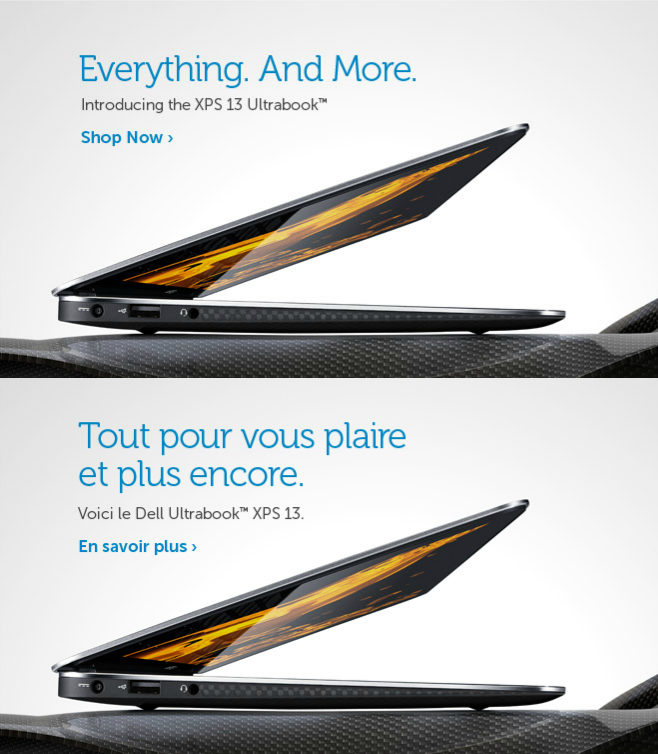 "If you go to Dell.com to purchase a laptop in France, or Germany for instance, the content you see is Post-Edited Machine Translation"
I know Dell has been using MT for a long time for Support content. Are you now able to use it for higher visibility content? Is MT effective for translating technical marketing material such as product specs and product webpages? Are more Localisation consumers ready to trust it? Since May of last year we have been using MT with Post Edit in the purchase path of Dell.com. 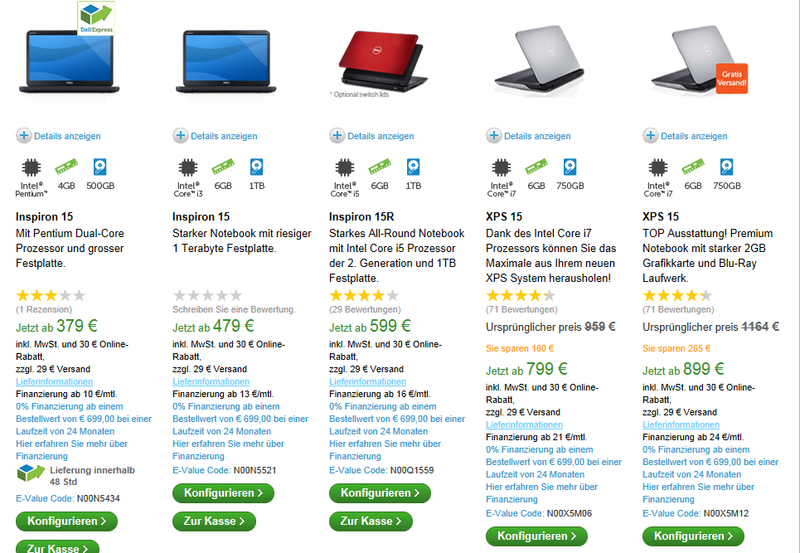 Meaning if you go to Dell.com to purchase a laptop in France, or Germany for instance, the content you see is PEMT. As of February of this year we are supporting 19 languages with PEMT. Yes, MT can be used for something other than support content. That’s not to say we have cracked the code, it still requires extensive Post Edit, we haven’t seen the level of productivity gains we had hoped yet, but we are making progress. Being on the cutting edge means dealing with setbacks. I don’t think it’s a question of consumer trust. I think if you’re doing a good job of understanding the consumer need for your domain, and you measure your MT program against quality KPIs that mirror those expectations (v. relying simply on BLEU scores and the like to tell you how you are doing), then consumer trust won’t be an issue. Which post-editing strategy produces the optimum results? Presumably it depends on the content type, but do you favour Post-Editing, Post-editing plus Review sampling, Post-Editing plus Full Review? What are the Quality assurance challenges specific to using MT? I favour all of the above, each has their place. Following on to my previous answer, it’s about understanding the desired outcome. MT will be ubiquitous some day and people need to get used to it. You don’t start with picking the right process, you start with picking the right outcome, the appropriate balance of cost, time and quality, and you work backwards to the right process. If you’re supporting a large operation like I am, or just about any large enterprise client translation team, you’re going to need a number of different processes tuned to the desired outcomes for each content type. You build a suite of services and then pull in the right ones for each workflow. What we are doing on Dell.com today is PEMT with quality sampling. We made a decision that full QA (which we are moving away from for all translation streams) didn’t make sense when you factored in the cost and velocity goals we had. Of course, we have a great set of vendors and translators that make the PE work. Our quality standard has not changed. Are LSP’s learning how to sell it? Is it finding its way into the standard offering of most providers or does it remain a specialists’ area only available for example in very big volume programs? I think some of them are. There are many LSPs out there who are still shying away from it, but the majority of your larger suppliers are getting the hang of it. They see the trends, they know that services, not words, is what will drive margin dollars, and MT is a big part of that service play. I wouldn’t say it’s standard yet though, it’s still handled as a completely separate conversation to traditional translation in many cases, but that is changing too. The more savvy LSPs are talking to clients about desired outcomes and how they can support that across the enterprise. The key is, at least for selling into large enterprises, you can’t be a speciality shop. 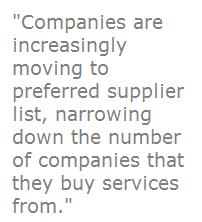 Companies are increasingly moving to preferred supplier list, narrowing down the number of companies that they buy services from. So going out and picking 2 or 3 translation companies, and 2 or 3 MT providers, and a couple of transcreation specialist is happening less and less. Clients are looking for a handful of vendors who can bring all of these services, either organically or through partnerships. You also expressed the opinion that the work of Translators would tend to polarise with high-end Transcreation type of work on one hand, and high-volume post-editing on the other. Are you observing further signs in that direction? How does the prospect of localising ever-expanding user-generated content such as blogs and social media fit into this view? I think this still holds true, we can argue about when it happens, but at some point MT will be a part of nearly every translation workflow. Traditional translation work may not decrease, but the growth will be in MT and MT related services. I think user generated content is the domain of raw MT or even real time raw MT. Investing dollars and resources to translate content that you didn’t invest in creating in the first place really doesn’t make sense. Either the community will translate it, or interested parties can integrate MT to support their regional customers, but I can’t see a business case for any other form of translation for this domain of content. Is the distinction between MT and TM loosing relevance? In mature setups, all content is highly leveraged. Often TM sequencing is used to maximise re-use even across content types, while taking into account the different levels of relevance. Post-editing and Review have to ensure any leveraged translation is the right translation in-context and at the time, regardless of its origin. In other words, once a match is fuzzy, does it matter whether it comes from human or machine translation? It shouldn’t matter, and I think eventually it won’t, but it still does today, to my frustration. Translators still dislike MT, even in case studies where it has been shown that the MT output was performing better than TM fuzzy matching. And of course MT still has its challenges. We just aren’t there yet, I see them co-existing for some time to come, but eventually they will be one in the same for all practical purposes. What are the main advances you have observed in TM Technology over the last few years? Which are the most significant from the point of view of a Localisation consumer? Translator productivity tools such as predictive text? In-context live preview? The deployment of more TMS’s? The variety of file formats supported? Or perhaps the ability to integrate with CMS and Business Intelligence tools? I won’t claim to be an expert on translation technology, but I really like in-context live preview and more TMS’s are starting to support it. Nothing beats seeing something as its going to be seen by the consumer for ensuring the most contextually accurate translation. I think all of the mentioned technologies have a place, but I am interested in tools that assist the translator. We have this crazy paradox in our industry where we have spent years trying to make human translators more machine like (increased productivity) and machines more human like (human quality MT). I think to a large degree we have neglected to innovate for the translator community. Too much time was spent trying to squeeze rates down and word counts up without really investing in the translator and their tools to facilitate this. By opposition, are there pain points you have been aware of for some time and are surprised are still a problem in 2012? There are a number of them, TM cleaning is way more difficult than it should be and good tools to help are sparse. The differences in words counts between different tool sets is also challenging (a quote generated by one vendor can vary widely than one from another vendor for the same job and with similar rates due to large deltas in word count). The ability to leverage from many Translation Memories and prioritise between them is in my opinion a must-have. Do you see any negative side to TM sequencing? Is the cost of managing linguistic assets a concern to customers? I think one potential negative to TM sequencing is it allows people to get lazy with TM management. Simply adding more TMs to the sequence doesn’t ensure success. The cost for managing linguistic assets is a concern, although I think we don’t always realize how big of a concern it should be. As mentioned above, TM cleaning is costly and time-consuming, but necessary. Clients and SLVs alike should put TM maintenance on the annual calendar, ensure at the least some time is devoted to reviewing the strategy. There is a lot of lost cost and quality opportunity in good TM management. It’s something I don’t think we do nearly well enough. How about TM Penalties? Do you see a use for them as a part of Quality Management strategy, or are they a cost factor with little practical use to the customer? I think they have a purpose, if you know one set of TMs is more appropriate for your domain you want to ensure it is used first for segment matching, however, it should be used cautiously. We penalized a TM when we shouldn’t have and it cost us a large amount of money before we figured it out. Hence the need to review your TM strategy periodically and also watch leverage trending! I see source Content Management, or Quality control during the creation of the source content, as a key to quality and cost control in Translation. Can you tell us about what you have observed? How is source quality controlled at Dell? Do you have any insight into the process of choosing and setting up Source Content tools with Localization in mind? I agree there is huge potential in controlling the upstream content creation process. It’s also, for many of us, very difficult to do. You’re starting to see a lot of clients and LSPs do more here. It’s another one of those services that SLVs can build into their suite to derive revenue from non-word sources. It’s also an area where translation teams can show innovation and have a larger impact on company objectives. We are in the process of implementing Acrolinx with several of our content contributors. I think the key is getting buy-in from the authoring teams and their management. You have to be able to demonstrate how this helps them and the bottom line. Are Terminology and Search Optimization Keywords managed in an integrated manner, from the source content creation to the Localised content deployment? You’re kidding right? I know you’re not, and it’s a really important topic, but no, we don’t do it in an integrated manner today and I think many of us are struggling to figure this one out. We are piloting an Acrolinx add-on that targets localized SEO, but I think a lot of education is needed for companies to understand the potential here. Your team uses a Translation Management System to collaborate with vendors and their linguists. What is your overall level of satisfaction with the technology? I haven’t talked to a single large enterprise client who is “satisfied” with their TMS. That’s not to say that everyone is unhappy, but many of us have had to invest a great deal of time and money into fitting the TMS into our ecosystems. The lack of observed standards exacerbates the problem. I don’t know what the solution is here, more competition would help, but it isn’t a silver bullet. Perhaps more interest from major CMS players would help drive innovation here. The CMS industry is much larger than the TMS industry, and integrations are becoming more and more common place. We will have to wait and see. 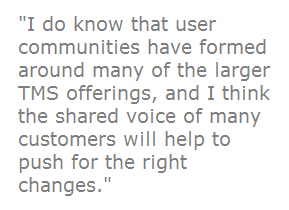 I do know that user communities have formed around many of the larger TMS offerings, and I think the shared voice of many customers will help to push for the right changes. If you’re not participating in one of these now, I would encourage you to do so! When purchasing enterprise solutions it can be difficult to accurately estimate the financial benefits. Providers will often help potential buyers put to together an ROI. With the benefit of hindsight, would you be able to share with us how long it took for your Translation Management System to pay for itself in cost saving? How did that compare to the ROI estimated at the time of the original investment. I wasn’t a party to the purchase and implementation of our current solution. I am aware of the cost, but not the promised ROI. However, I can say that it probably paid for itself in year 2, due more to the volume ramp than anything else. I would certainly say utilizing our TMS solution more than pays for the on-going maintenance. I do know that moving between TMS’s, when you consider the level of integration we have, would be daunting and the ROI would have to be very large and very attainable. Which would be your top 5 criteria if you were to purchase a new Workflow System today? There are probably 100 more factors…. I’ve come across a number of relatively news TMS’s recently. They often have some nice new features, and friendlier, more modern user interfaces. But I find they tend to lack features users of the more established systems would take for granted: TM sequencing, the ability to work offline or even download word count reports are not necessarily part of the package. Have you had opportunities to compare different systems? If so what was your impression? We are so tightly integrated with a number of CMSs that we have not been in the position to look at other options. I think that is the key challenge for companies selling TMSs, how do you break the lock-in. The upgrade process for TMS systems is sometimes difficult because of the vast number of users involved or the automation and development effort which may have been done to connect to Content Management Systems, Financial Systems, Portals etc. Is that also your experience? Can you tell us about your process for minor and major upgrades? We feel this pain often. We have rarely had an upgrade that didn’t spawn additional issues or downtime. We have worked with IT and the tool supplier to setup regression testing, testing environments, upgrade procedures, failure protocols, etc. but it still seems we can’t pull off a seamless launch, primarily due to a failure of some sort on the supplier side. It’s frustrating, and many of my peers are having the same experience. In the domain of Quality Control, the availability of QA Models in TMS’s seemed like a major development one or two years ago. Yet I find they are not actively rolled out, and offline spread sheet-based Quality Reports have proven resilient. Is that also your experience? And do you think the trends towards more flexible and content-specific quality measurement systems like that of TAUS, particularly in the area of gaming, make online LISA-type QA models more or less adequate? We championed the inclusion of a QA system in our current TMS and don’t use it. We found that it just wasn’t robust enough to handle all of the different scenarios. We still use spreadsheets; it has worked for years and probably will for many more. We are participating with TAUS on their new proposed quality model and I am anxious to see where it goes, I think the use of the content and the audience plays a big role and are ignored in quality models today that just look at linguistics. Customers don’t care about linguistics, they care about readability and if the content talks to them or not. Do you know the proportions of Translators and Reviewers respectively, working online and offline on your production chain? Is this proportion changing or stable? What do you think would be the deciding factor to finally getting all linguists to work online? I think it is about 50/50 right now, but that’s really more a difference in how our different vendors work than tools or process. I don’t see it changing in the near term, but I would like to see more move online, I think there is opportunity for quicker leverage realization and other enhancements that make a completely online environment look attractive. As you probably know, Ireland has had a pretty rough ride in recent years. But the Localisation industry is doing comparatively well. What are the main factors to explain Ireland’s prominent place on the Localisation Industry. Many companies have their decision centres and supplier partnerships setup from Dublin when it comes to Localisation. Do you think this will continue in the future? Wayne will participate to two discussions at this year’s LocWorld Conference in Paris, June 4-6: one about Dell’s Self Certification program for Translators and one about Multilingual Terminology and Search Optimisation. Self Certification is a concept implemented by Dell where instead of having Translation and then QA, Translators perform a few additional QA steps to certify their own work. This removes any bottleneck due to a full-on QA step. Independent weekly sampling and scoring are used to monitor the system, but is not a part of the actual production chain. SDL recently made a statement via the SDL Users Group on LinkedIn updating and clarifying their strategy for their 2 competing Workflow Management applications, WorldServer and TMS. The overall message is that WorldServer is now the flagship product, but support and development will continue for both products until at least 2013. 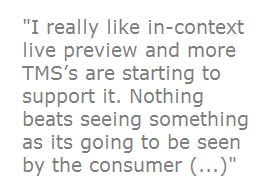 This may be seen as a change in direction compared to what was originally stated when SDL acquired Idiom in 2008, and the priority seemed to be given to TMS. However, SDL commits to a Service Pack 3 for TMS 2011 and at least one new major release, tentatively called SDL TMS 2013. Giving priority to WorldServer is in my opinion the correct choice, but this still seems like a non-fully committed announcement, and we could easily see another adjustment by 2013 or later. Having first hand experience using and managing both applications, I want to take this opportunity to share with you what I think are the main strengths and weaknesses of each system, and why my personal preference goes to WorldServer. WorldServer is the clear winner in this category. It has a very intuitive, flexible and powerful graphic workflow designer. TMS really only offers lists of entries to pick from, and I find the Workflow/Configuration distinction inefficient. WorldServer workflows can go back and forth, but also loop and go through parallel Steps. It can skip Steps, or offer multiple transitions in and out of every Step. The transitions are represented as radio buttons when a user completes the Step. In TMS, one can only Submit a Task to the next Stage or Reject it back to the previous one. You can also add your own custom Human Steps and Automatic Actions (through Java script imports) to WorldServer’s catalog (more about customisations in the next section). Even the Task History shown within projects is much clearer, with a graphic representation of the full workflow, with current Step visually highlighted, as well as a list of past Steps with owners, time stamps and global comments included. User permissions in WorldServer can seem confusing at first, but once the Administrator gets familiar with them, the possibilities are limitless. Each users’ privileges are defined through a set of parameters. All of these are fully customisable, meaning that you can not only adjust their settings but also create entirely new categories. User Types define the general rights: project view or edit access, TM and TD read or write access, possibility to edit offline, import export etc. Workflow Roles: define who is assigned specific Steps in a Workflow, in conjunction with the Locales. This may be set for specific users or entire Workgroups. Project Types are presets used during project creation to automate the linking to TMs, TDs, Filter groups, Workgroups, Cost Models etc. Clients determine access to the Transport Portal for project submission or quote requests by third-party users. All this potential for customisation can mean time-consuming setup. Thankfully by exporting and importing WorldServer Objects settings can easily be copied from a test to a production environment. Items can be backed up for recovery or roll-back, either in batches (e.g. all settings for a certain customer) or individually. For instance, you could export a whole workflow as an xml file, rename it and reimport it to quickly create a variant of it. Filters are also much better in WorldServer than TMS. While in TMS Filters are SDLX-based and only some can be customised, in WorldServer they can be imported from a number of CAT tools (Trados ini, xsd, dtd, raw xml). All Filters can be edited from the WorldServer UI, they can be teamed up in Filter Groups and linked to Project types. WorldServer Projects use the out-of-the-box filters unless the Project Type is linked to a custom filter for the given File Type. But WorldServer filters are not perfect in every way: I have experienced problems with certain rtf files, json files, even xlsx (in relation to repetitions) in WorldServer 2009. Still few tools can filter xml and resx files as precisely as WorldServer: the content of one tag can be set to be exposed to translation or not depending on the value of another tag’s attribute. There are even desktop CAT tools which can’t do that! Here TMS has a few unique features that its users would probably miss if they migrated to WorldServer. For example, Project Managers can impersonate other users to check the content of their Inbox, or even submit Tasks on their behalf if they were unable to do so themselves. This is much faster than logging as those users every time. TMS also lets translators upload multiple deliveries within the same zip file. The version control is smart enough that you do not need to open the project for which you are submitting a delivery. 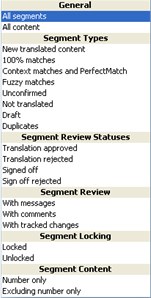 Another interesting out-of-the-box feature of TMS is the QA Check which can be set to run automatically to prevent submission to the next Stage if for example there are untranslated segments or Terminology inconsistencies. The QA Check can be overridden by users if needed, but it is a useful automation. Overall though, I find the .NET Framework-based UI is a lot more rigid and prone to screen freezes than WorldServer’s Browser-based UI. The latter is more friendly and requires less training and user support because it mostly works like any website. That said, it is also one of the downfalls of WorldServer: the browser support is not always keeping up, particularly with Firefox. Since browsers are often set to auto-update, this is a problem. Browser-specific issues can be difficult to troubleshoot. Getting a hotfix from SDL for them has proved impossible. 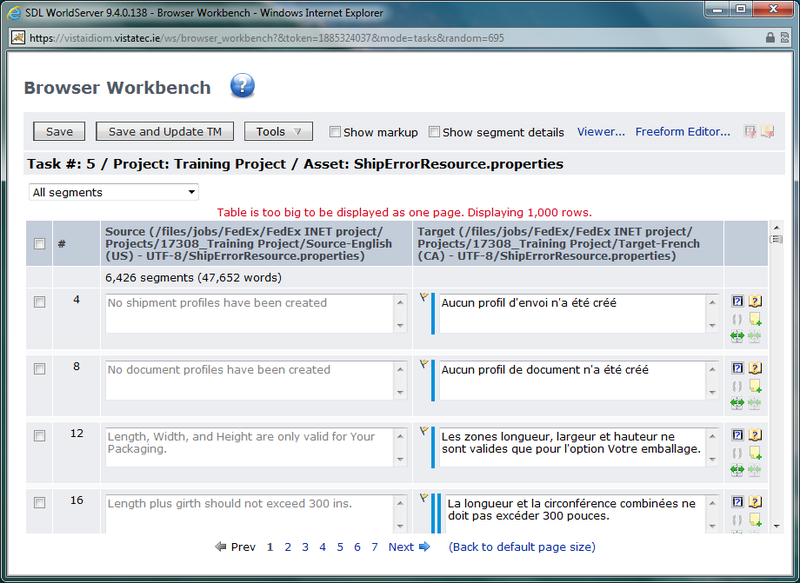 For linguists working online WorldServer’s Browser Workbench has an edge over the outdated TMS Translation interface. Again it benefits from being browser-based which makes it more intuitive and versatile. User support is much lighter with WorldServer than TMS. Things are a little more complicated when it comes to working offline, which is the most common scenario. Both tools have removed support for TTX (i.e. Trados 2007) in their 2011 releases. 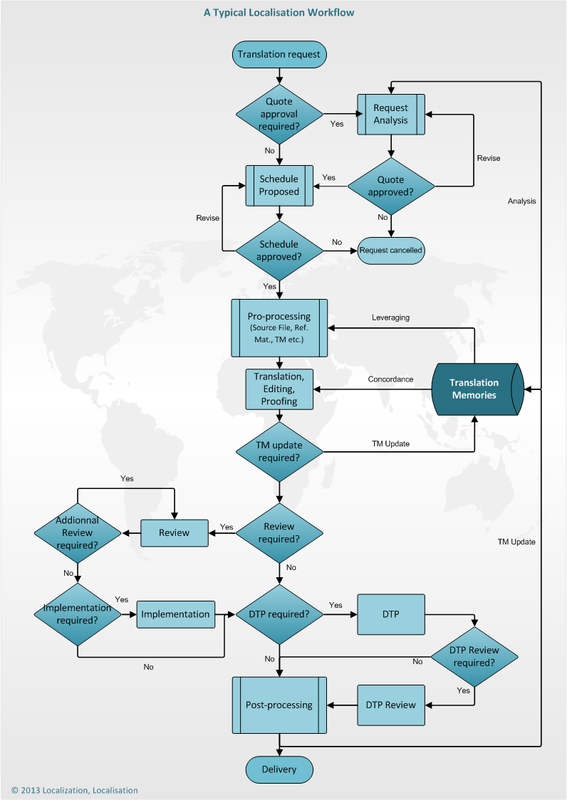 This is part of the push for linguists to migrate to Trados Studio. TMS relies on ITD’s for work in SDLX which is also very outdated. Both tools support downloads for Trados Studio. Up until WorldServer 2009, the “free” tool Desktop Workbench was available and quite full-featured. In WorldServer 2011, it is only compatible with projects using legacy (i.e. Idiom) file Filters and not the new Studio File Types, which require Trados Studio. Even worse, Desktop Workbench is about to reach end-of-life. In short, whichever Workflow system you are using, SDL are actively pushing for linguists to use a version of Trados Studio, whether it is the full desktop tool, Studio Online for TMS or Studio Express for WorldServer 2011. None of these are free. This is an area where I’ve always had concerns about TMS. WorldServer still benefits from a more CAT Tool-agnostic approach dating from the IDIOM era. It can be used as a full-fledged Translation Memories and Terminology Repository and Portal. Through User Types and Workgroups, access to the Tools tab can be precisely managed. Users can view selected individual or Groups of Linguistic Assets, and the Administrator can easily turn Editing, Exporting, Importing, Purging, on and off for either Linguistic asset types. Term-based workflows can even be created so the Terminology approval process can be managed exactly like any other WorldServer Project. TM sequencing can be setup in both systems. TMS is the only one to allow the updating of multiple TMs. But WorldServer has a more sophisticated leveraging algorithm, cycling through all the TMs in the Groups for each fuzzy band, including ICE (in-context) Matches and reverse leveraging. TMS earns a few more points here: for example LDAP support makes User ID Management more flexible. It also appears less complicated to install because WorldServer has so many separate components. However WorldServer is immensely more scalable. The database architecture is well thought-out and individual components can be separated into clusters, which has advantages for troubleshooting and reliability. Rookie Story: Where to Start with Localisation Management? Congratulations! You aced that interview a few weeks ago, and this morning you strolled into the office with a spring in your step! You had the HR induction and were introduced to your new colleagues. Now you’re logging onto the network, the company handbook reassuringly lying on the corner of your desk, or saved on your desktop. Time to get started! The Company hired you to bring under control this thing almost mysteriously referred to as “Translations”. Your objectives are simple: reduce cost and improve quality. You are their first ever Localisation Manager, and you know the keys to your success will be the standardisation and centralisation of all Localisation activities. So what do you need to consider from a technical and organisational point of view? Who are your allies? Each Department, Local Office etc. probably has at least one “Translation person”. Find out who they are and what they have been doing. Determine whether they will remain involved once you’ve established the new structure, or if they expect to be relieved of Localisation duties. All going well, you may be able to enroll some of them in an inter-departmental Localisation team, even if it’s only a virtual team. What is the inventory of current processes? Meet the current owners and document everything. No need for anything fancy since you are going to change these processes, but you need to have it all down so that when the inventory is finished you have an accurate and complete picture. What are the points common to all? Which of those processes work well and which don’t? The successful ones will be the building blocks for your future world. What are the specificities of each one? Which are worth keeping? Can they be used by other parts of the Organisation? Do they need to remain specific? Your new processes will need to achieve a balance between harmonisation and flexibility. Do any of those existing processes use technology such as CAT Tools, Content Management Systems, Translation Management Systems? If so should they be upscaled and shared across the Organization? Do any maintain linguistic assets like Glossaries, Style guides, Translation Memories or even just bilingual files which could be used to create TM’s? What types of content: marketing, commercial website, Software, Help systems, self-service technical content, user-driven content like blogs etc. all those use very different registers, vocabulary, address etc. Moreover the choices made will differ again from one language to the next. Some content types require high volumes at low cost, such as Support content or product specifications. Some require high quality and creativity like Copywriting and Transcreation and you may even choose not to use TM’s for some of those. Some will be specific to parts of your Organisation while other will be global material. You will need to ensure a consistent Corporate identity across all these, in all languages. What are the fields: automotive, medical, IT require linguists with different backgrounds and specialisation. Make sure you know all the areas of expertise to cover during Translation and Review. For some you might to add Subject Matter Expert (SME) review to the more common step of Linguistic Review. Review changes will need to be implemented, communicated to Translators, fed into the TM’s, but the process will need to let SME’s take part in the process without having to learn CAT Tools. From a technical point of view you will also need to work with the content creators to determine the type of files you will receive from them and those they expect to receive back. Start a war on spread sheets as soon as possible. You probably won’t win it but the more you root out, the better. Teach your customers to understand how parsing rules protect their code by exposing only Localisable content during translation. Promote Localisation awareness during Development and Content creation. Document best practices such as avoiding hard-coded strings, providing enough space in the UI to accommodate the fact that some translations will be up to 30% longer than source text, at least if that is English. to deliver files that your customers can drop into their build or repository for immediate use. No one should be doing any copy-paste engineering, manual renaming or file conversion. This can start with a pen and paper, a white board or whatever helps you think quicker, but it should end with a flowchart or set of flowcharts describing the process you’re setting up. Collaborate with your internal customers. You need to agree a signoff process, and avoid multiple source updates during or after the Translation process. How many workflows do you need to describe all scenarios? Try to find the right balance: fewer workflows ensures efficiency, but too few workflows will lead participants to implement their own sub-processes to achieve their goals and you will lose control and visibility. Who are the owners of each step? Are they internal or external (i.e. colleagues or service providers)? How will you monitor progress and status? How will you pay? Is there a feedback loop and approval attached to certain steps? Will they prevent the workflow from advancing if certain criteria are not adhered to? Is there a limit to the number of iteration for certain loops? What automation can be put in place to remove human errors, bottle necks and “middle men” handling transactions. Once you’ve determined which of your workflow steps need to be outsourced, you will need to select your providers. Linguistic vendors will likely be your most important choice. In-house translators are a luxury rarely afforded. When choosing Translation vendors, first decide between Freelancers and Language Service Providers (LSP). Managing a pool of Translators is a job in itself, so most will hire the services of an LSP which will also be able to provide relief in terms of Project Management, Technology changes, Staff fluctuations depending on activity or holiday periods etc.. Having more than one LSP can be good strategic choice: it gives you more flexibility with scheduling and pricing. You can specialise your vendors according to content, region or strength. A certain amount of overlap is necessary for you to be able to compare their performance and benefit from a bit of healthy competition. Whichever setup you have for Translation, you will need linguistic review in order to ensure the integrity of the message is kept in the target languages. You will also need to ensure consistency between Translators or Agencies, check Terminology, maintain TM’s and Style guides. Marketing and Local Sales Offices often get involved with that. However using internal staff removes them from their core tasks, unless you are lucky to have dedicated Reviewers. More than likely in-country colleagues will find it difficult to keep up with the volume and fluctuations of the Review work and ultimately will prove an unreliable resource. The solution is to hire the services of professional Reviewers. Many LSPs provide such services. Some ask their competing providers to review each other, but that often results in counter productive arguments. A third-party dedicated review vendor will be the best to enforce consistency, accurately measure quality, maintain linguistic assets, and even manage translator queries on your behalf. Translation Memory technology is a must. Which one you go for may be determined or influenced by existing internal processes, particularly if there are linguistic assets (TM’s and Glossaries) in proprietary formats. Your vendors may also have a preferred technology or even propose to use their own. If you go down that road, make sure you own the linguistic assets. The file format is another choice that needs to be made carefully from the start. Open source formats may save you from being locked into one technology. However technology vendors often develop better functionalities for their proprietary formats. It can be a trade-off between productivity and compatibility. The good news is that conversion between formats is almost always possible. This means migration between technologies is possible, but avoid including conversion as a routine part of the process. Even if it’s automated, having to routinely output TM in several formats for example, will introduce inefficiencies and increased user support requirements. Translation Management Systems have become so common, some think they are on the way out. You will at the very least, need a Portal to support file transactions, and share your linguistic assets with all the participants in your supply chain. Emails, preferably automatic notifications, should be used to support the transactions, but they should be avoided when it comes to file swapping. FTP is a common option, easy to set up, learn and cheap to run, but it can soon turn into a mess and gives you zero Project Management visibility. In order to achieve efficient status monitoring, resource pooling and any type of automation, you should consider a Translation Management System. Whether you go for the big guns like WorldServer or SDL TMS, or for something more agile like XTRF TMS, you will reduce the amount of bottle necks in your process: handoffs will go straight from one participant to the next. The Project Managers will still have visibility, but no one will have to wait on them to pass on the handoff before they get started. TM’s will be updated in real-time and new content will become re-usable immediately. Less click = shorter kickoff time. Setting up Projects in a TMS is an investment. It is always going to be longer then dumping files on an FTP and emailing people to go get them if you look at an isolated Project. As soon as you start looking at a stream of Projects TMS makes complete sense. Still, a TMS’s worst enemy is how many clicks it needs to get going. Scalability: you need the ability to start small and deploy further, without worrying about licenses or bandwidth. Workflow designer: demand a visual interface, easy to customise which can be edited without having to hire the services of the technology provider. Don’t settle for anything that will leave out at the mercy of the landlord. Hosting: weigh your options carefully here again. In-house is good if you have the infrastructure and IT staff. But letting the Technology provider host the product may a more reliable option. This is their business after all, maybe you don’t need to reinvent the wheel on that one. User support: the cost and responsiveness of the Support service is essential. No matter how skillful you and your team are, once you deploy a TMS to dozens of individual linguists there will be a non-negligeable demand for training and support. Make sure this is provided for before it happens. Crowdsourcing in Localisation: Next Step or Major Faux Pas? Which comes first, Globalization or Internationalization? Who’s responsible for Localization in your organization? SDL Trados Studio 2011 Preview: Can It Convince Trados 2007 Faithfuls? SDL have been drumming up interest for SDL Trados Studio 2011 through the summer. Eventhough the successor to SDL Trados Studio 2009 is announced to release at the end of September, I must admit that I have been slower to turn my attention to it than I was with Studio 2009. This is in part due to my current occupation which brings me to spend more time using Translation Management Systems than CAT tools. But it is also because SDL Trados Studio 2009 was such an exciting breakthrough: the idea of fully integrating SDLX, Trados and Synergy was a major shift. The technology behind the new Studio file formats (.sdlxliff bilingual files, .sdltm Translation Memories, and .sdltb Term database) was also quite promising. Lastly, the productivity improvements were many thanks to the entirely new xml-based TM engine, which allows multiple TMs look-ups, AutoPropagation™, AutoSuggest™, QuickPlace™, Real-Time Preview etc. Reading through those posts about SDL Trados Studio 2009 reminds me how attractive it seemed. But there was also a distinct possibility that this substantial innovation would not necessarily cause a mass migration of Trados 2007 users. Budgets were tight due to the worldwide recession. The prospect of migrating entire Localisation production chains seemed like an unnecessary overhead. Users would have to be re-trained, Enterprise and LSP proprietary automation redesigned in order to work with those new file formats. Above all, SDL Trados 2007 was delivering perfectly acceptable services. So let’s now turn to the future and look at SDL Trados Studio 2011’s prospects. New comers to the CAT tools market will inevitably consider Trados as one of their options; which new features it offers does not matter much. As for existing Studio 2009 users, I doubt any amount of innovation can make them upgrade if they haven’t already a budget or subscription plan which allows for systematic upgrades. The real measure of the impact of Studio 2011 will be whether it can convince the remaining Trados 2007 users. What does SDL Trados Studio 2011 bring to the table to meet the needs of this demographic? All the great advances made with Studio 2009 are of course still available, although some of them have matured. The main highlights in terms of novelty are the return of Perfect Match and the focus on productivity during review cycles. Perfect Match makes a return to Trados: it existed in Trados 2007 but was absent in Studio until now. It now co-exists with Context Match, and together with Terminology and Sub-Segment leveraging make up the concept of Total Leveraging. Perfect Match can run on a batch of files (right-click a bilingual file to pre-translate and select Batch Tasks > Perfect Match) and is good for Project rather than document updates. SDLXLIFF, TTX and ITD are all supported. Context Match runs on successive versions of the same file, file names have to match. They are marked as PM and CM respectively in the resulting bilingual files. Both segment types are locked. Studio 2011 uses a change tracking technology which is fully compatible with Microsoft Word. Thanks to the SDL XLIFF Converter, an SDL Open Exchange add-on now included in Studio, changes and comments made in Trados can be viewed, accepted etc. in Microsoft Word and vice versa. This makes it easy to collaborate with users who do not have Studio during the review process. Whether they are linguists using other CAT tools or Subject Matter Experts not familiar with any CAT tool, they will all be able to input their feedback using Word. The versions of Word officially supported are 2007 and 2010; 2003 should work but this is unconfirmed for now. Track Changes can be turned on or off for different parts of the process such as Translation, Review or Signoff under Options > Tools. In Trados Studio, segments can be filtered to show only those relevant to the current task. The filters in this list are another way Studio 2011 helps productivity during review, with new options such as Segments with Comments or Segments with Track Changes. These filters can also be applied during export using the SDL XLIFF Converter. Trados Studio 2011 brings the Microsoft Spell Checker back. Hunspell is still available but users can now configure which checker to use for each language. This is to resolve issues present in the Studio 2009 Spell Checkers which were not fully accurate for certain languages, notably Scandinavian ones. 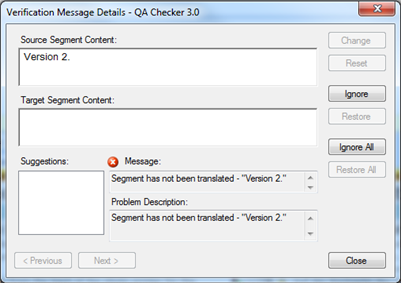 QA Checker 3’s claim to fame is the interactive dialog box which makes reviewing and implementing reported issues a much clearer process. It is reportedly also a first step in longer term plans of adding grammar checks. OpenOffice, Libre Office, StarOffice and IBM Lotus Symphony. bilingual Word files which can now be edited directly. 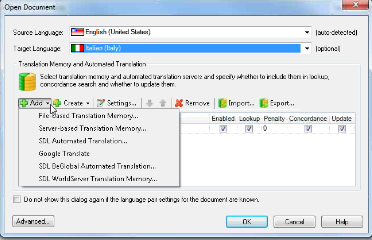 Other novelties to discover in Trados Studio 2011 include pseudo-translation, for testing parsing rules and settings before the launch of new Project Types. Character, rather than just wordcount is now also available. First impressions tend to last, and the installation and activation process are a big part of how a new application is experienced by users. In Studio 2011 the installation is made simpler. One single installer enables compatibility with Trados 2007 file formats (.ttx, .itd, TM upgrades and alignment tasks). With TTXit!, freely available on SDL Open Exchange, users should no longer need a copy of Trados 2007 in addition to Studio. Because the user interface and technology in Studio 2011 are so similar to Studio 2009, no big learning curve is required. Any time and effort invested in learning to use Studio will just give users a head start in being proficient at the new version. Starting a project itself is a simpler process, with only 3 files needed (source, bilingual and TM), and no associated folder structure in the background. The standalone License Manager has been replaced. Activation is now fully integrated into Studio, and borrowing licenses are supported. Finally, the SDL Multiterm Widget is being pushed into the limelight. This taskbar tool lets you browse Terminology from external applications like Microsoft Excel, Powerpoint etc. at the touch of a button. It also provides a handy shortcut to searches in Google or Wikipedia and is now included in Trados Studio. Technology webinars have been an SDL strength for a long time now. Call it free education or a carbon-conscious alternative to business trips, they are an efficient way for any technology vendor to showcase their goods. There are other ways SDL share information about Trados like the Studio 2011 Series on the SDL Blog, or the SDL Trados Youtube channel. SDL are certainly not the only language technology provider to use new media but I think it’s fair to mention their consistent effort to meet their user community and ensure information is widely available. SDL OpenExchange is also used to promote this spirit of community with Developers (look out for prize competitions!) and has produced a number commercial as well as free Apps which efficiently respond to very specific needs. The connectivity with SDL’s Enterprise applications is also kept up to date. Studio 2011 can connect to WorldServer or TMS Translation Memories for Concordance just like it would with local TMs. An Express Edition of Studio 2011 will be released for users who need Studio only for WorldServer projects. While this is as efficient as one could expect, there are cases where “manual” updates of the online TMs must be performed. A Terminology change may have to be implemented globally into legacy TUs. A linguist may be asked to perform an offline clean-up of an overgrown or aging TM, and the resulting file may have to be imported back into the online TM. Audits may be conducted on live content and also require manual edits of the online TMs, etc. In most cases, these edits will need to be performed by accessing the remote TMs using SDLX rather than SDL TMS 2007. This is because SDL TMS doesn’t let linguists directly edit TMs, as I previously explained. The present post describes the step-by-step process to update TMs hosted on an SDL TMS 2007 server, using SDLX 2007. It can be used by linguists such as Translators, Reviewers or Language Leads or by Engineers depending on who in the process is in charge of implementing manual edits such as global updates or imports. SDLX 2007 Professional: no access to remote TM Servers is possible for SDLX Light or Freelancer users. Once the connection is established, open the Translation Memories drop down menu and select the TM to edit. Click OK twice to validate your choice and close all dialog boxes. Hot on the heels of SDL TMS 2011 which was recently reviewed here, SDL Technologies released SDL Studio Online 2011. 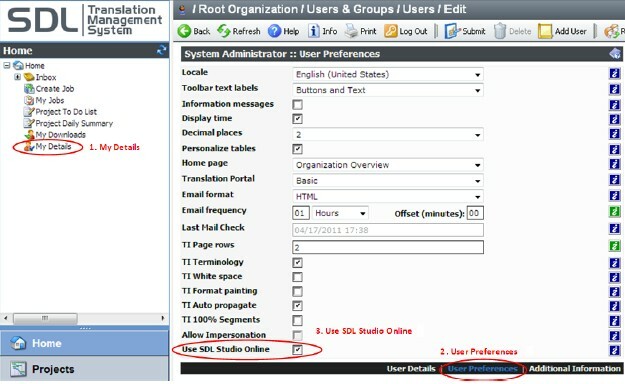 In a nutshell, SDL Studio Online 2011 is an optional add-on exclusive to SDL TMS 2011. 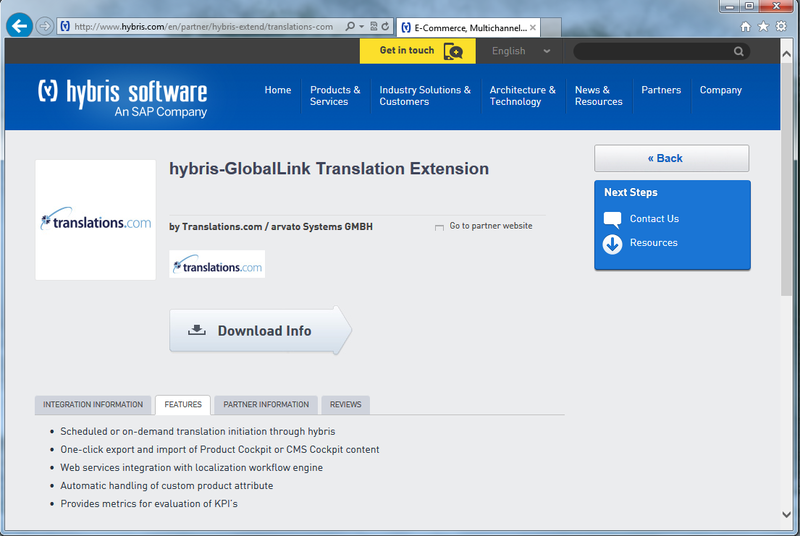 It is distributed as part of the SDL TMS 2011 Service Pack 1 and upgrades the SDL TMS Translator Interface. 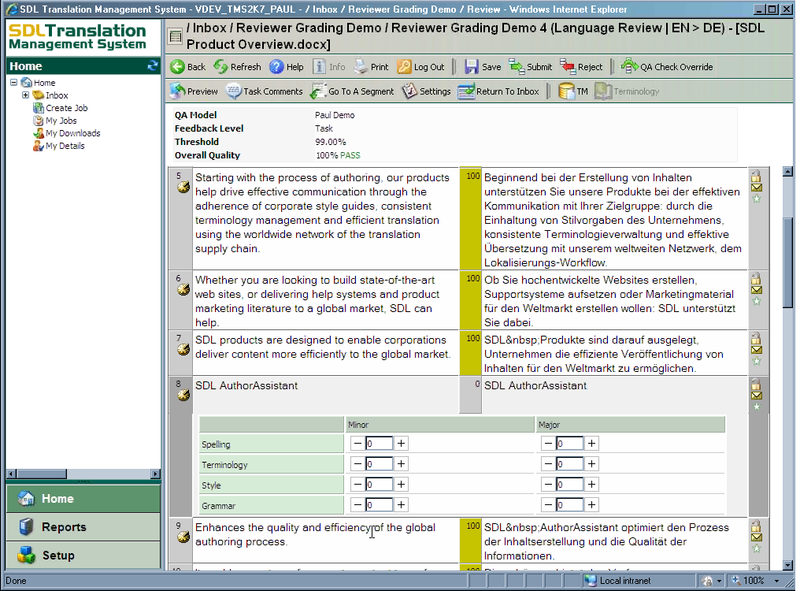 While SDL TMS 2011 introduced a new Carbon Theme, its Translator Interface was in fact still a slim version of SDLX 2007. SDL Studio Online 2011 replaces it with an SDL Trados Studio inspired successor. Combined server and user-side performance issues: this should already improve with an upgrade to the original SDL TMS 2011. Integral spell checking with Inline and batch spell checking, multilingual dictionary and correction and user-specific dictionaries. Support for Microsoft input method editors (IMEs) for typing East Asian characters on non-matching language versions of Office. Studio Online is a Microsoft Silverlight plug-in. It requires Microsoft Silverlight 4 and the latest available Service Pack for Windows. Its upgrade or installation process is guided in Studio Online. Other requirements are Microsoft Internet Explorer 6.0, 7.0, or 8.0 and Mozilla Firefox 3.5 or 3.6. Studio Online Licenses have to be purchased in addition to the SDL TMS licenses for a specific number of concurrent users. Once installed and licensed, each user may choose to configure SDL Studio Online as their default editor in SDL TMS by going to Home – My Details – User Preferences and checking the option Use SDL Studio Online (see screenshot). This remains optional, so not all users have to make this choice. Task download for offline work also remains available in any case. One limitation to note is that SDL Studio Online 2011 does not integrate with the QA Models. If you have made use of the online rating function added since SDL TMS 2007 SP4, you will have to make a choice between that and the new online interface. My inclination would be towards allowing the Translators to use Studio Online to make it more acceptable for them to stay online throughout the translation process. On another hand, Reviewers could continue using the old interface so that they use the QA Model, and so that you save on Studio Online licenses. As Kilgray Technologies made memoQ 5.0 Release Candidate available for download right on queue last week, there is another piece of Kilgray news I’d like to share with you. The lesser-known but aptly named TM repository was launched recently by the makers of memoQ and offers an interesting and fresh approach to Translation Memory server products. This application apparently pre-dates memoQ but wasn’t launched commercially until this year. Since then, Kilgray have been gathering early adopters feedback, which they are planning to include in a version 2 sometime next year. TM repository is made-up of 3 components: the database, the business logic and the web-based interface. It is built on SQL technology and comes in 2 editions depending on the number of users required. The idea behind any TM server product is to provide a central location where all users in a supply chain can access the same and latest version of Translation Memories. Different Localisation Managers have different TM Strategies which are often dependent on the CAT tools or even the version of the CAT Tools in use by the Assets owner and their LSPs. Important choices have to be made in terms of Maintenance, most of which have to do with how best to archive TMs for re-use. Working from project-specific TMs only gives smaller leveraging power and little version control ability. Yet it is sometimes the chosen path, simply because it seems more manageable. On another hand building and maintaining Master TMs containing all segments ever translated, or even chunks of them organised by Product lines, Business Units etc. requires a sustained management effort. For instance, when there are terminology updates a linguist should implement global changes by batch editing Translation Units. They may spend time fixing old Translation Units (TUs) which will never be used again. It may also be difficult to find linguists with the skills to directly edit the TMs for all languages. More often than not, Master TMs which are not integrated with a Translation Management System will contain errors, deprecated terms, duplicate TUs with alternative translations etc. and require clean-up. The Project TMs-only route will always underperform in terms of ability to re-use existing translations and ensure consistency, but the Assets owner are still left to evaluate for themselves which option is the best for them. It enables the Assets owner to create a single Online TM Database containing all TUs, for all projects, and all language pairs. The flexible descriptive fields (metadata) allow the TU’s to be tagged precisely. Exports can be customised for the CAT tool in use through customisable Mapping. Query results (i.e. Project TMs) will contain metadata compatible with the target translation tool. Refined Maintenance is enabled through features such as Search and Replace of text or metadata, or the use of deprecation settings by which older TUs can be hidden from search results. The pace of release of Enterprise Technology such as Workflow and Translation Management Systems is usually slower than that of end-user applications such as CAT tools. First, the priority for Enterprise Applications is stability, not cutting-edge User Experience. Users, and especially customers, require proven and sturdy environments capable of consistently handling massive traffic. This cannot be compromised in favour of the latest UI bells and whistles, not even the newest linguistic asset formats or features. Secondly, the licensing and pricing model for these applications is such that customers have to monitor their ROI more carefully. Purchasing decisions would not be influenced with yearly or even bi-yearly releases of brand new product lines. The expectation is that these Applications provide a permanent Solution which can be used for several years to come. For that reason, Support contracts tend to include free Patches and even Service Pack upgrades which take care of the more pressing updates. Last but not least, the efforts required in deploying these server-based technologies are again prohibitive of frequent upgrades. There are infrastructure implications like matching SQL server versions or multiple server roll-out workload. The technology also needs to co-exist with a number of desktop applications in use in the supply chain. From reading the SDL TMS 2011 Release Notes, I think the differences with its predecessor, SDL TMS 2007, are very much inline with these requirements. It seems to deliver relevant compatibility updates as well as promising improvements in usability and performance. If the announced increased reliability delivers, then I think one of the key to its success over SDL TMS 2007, will be whether it succeeds at making linguists more willing to work online, or whether they will continue to prefer to use it for File Transfer only and perform the actual linguistic work in their desktop CAT tools. This is the first major release of SDL TMS since the acquisition of Idiom by SDL back in 2008. Together with the recent release of SDL Worlserver 2011, this confirms that in the short to medium term at least, these two Workflow systems will continue to coexist. 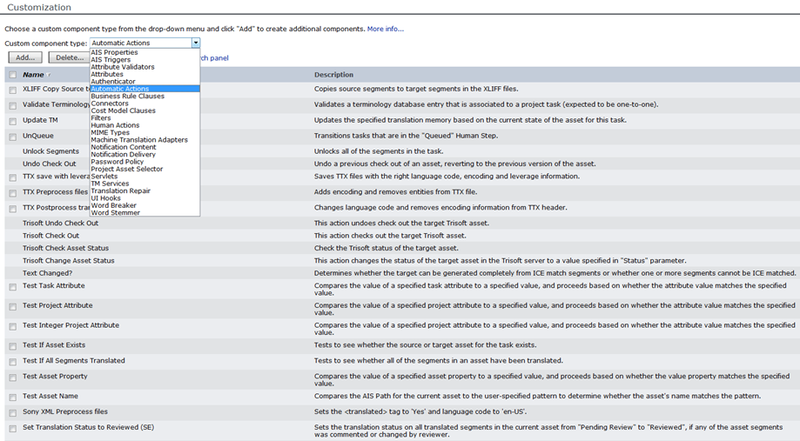 SDL TMS can be upgraded to version 2011, though only from SDL TMS 2007 SP4 or later. SP4 would have to be installed first, before upgrading from any older version. One piece of good news is that no data migration is required when upgrading, and all Post-SP4 hotfixes are included in the Upgrader. Microsoft .NET Framework 4 is recommended. The User Interface has reportedly been made more responsive in several areas: Translation Interface, Job Authorisation, Configuration edits and more. The UI has been updated with a new colour theme, but apart from that the navigation appears to be unchanged. We will investigate in an upcoming article how this may be changed by the addition of SDL Studio Online. SDL Studio Online is an optional web-based version of SDL Trados Studio 2011, exclusive to SDL TMS 2011 SP1. The Search feature has also been improved with increased speed for the main Search (results are now limited to 2,000 matches) and a new “Go to” feature lets users directly open specific Jobs or Tasks if they know the ID. SDL Trados Studio can now access SDL TMS directly for TM Concordance and updates. 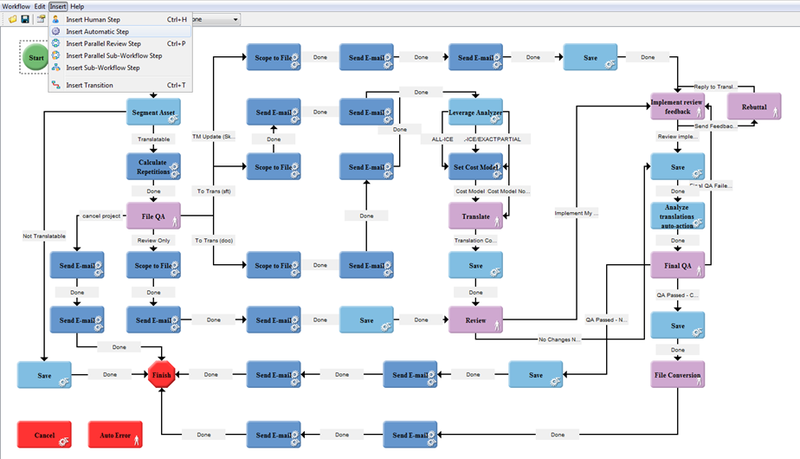 This is achieved through an SDL Open Exchange plug-in. Once installed, users simply need to login using the SDL TMS Server Name, Username and Password, much like previously in SDLX’s SDL Maintain. Unfortunately, Tageditor’s TTX files can’t be downloaded from SDL TMS 2011. 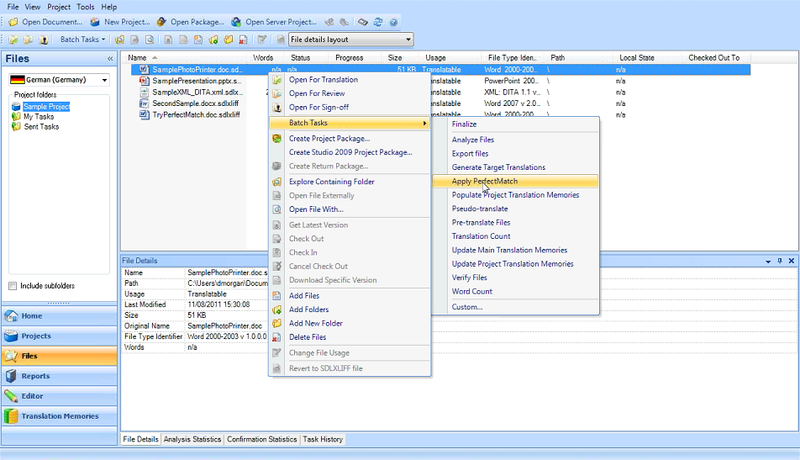 SDL recommend downloading Packages, which contain the ITD files for translation in either SDLX 2007 or SDL Trados Studio 2009. Eventhough SDLX is considered a part of SDL Trados 2007, this makes using Tageditor and Workbench more difficult and more-or-less means support for Trados 2007 in SDL TMS has been dropped. Terminology imports have been enabled through a new functionality similar to the TM import added with SDL TMS 2007 SP4. This works using SDL MultiTerm .xml import files and a matching database definition. Passolo Terminology (sequences and TB updates) is also supported. SDL claim that over 200 reported issues have been resolved, including a number reported by users through ideas.sdl.com. Improvements in file format support and exception handling should limit the number of failed Jobs and Tasks. Only segments added or modified since the last export are exported. They are added to the latest corresponding TMX export file. All TMX export files can be downloaded at once. I always find it challenging to get a fair idea of what Enterprise tools can do before making a purchase decision. There is so much involved in setting them up that even if a trial version is available, the efforts required to perform meaningful testing are prohibitive. Many such applications do not come ready out-of-the-box and require extensive customisation before they can be tailored to fit a specific business model. This is why many purchase decisions are executive decisions, based on ROI reports and presentations showing what the software does. A demo might be setup for you on a dedicated server by the sales person, and you’ll be left thinking “hum…surely it’s not that simple”. This is also why 10 times out of 10, these pieces of software come with a Support package which lets you install regular and much needed updates and bug fixes. If you have the opportunity, go knock on a few door and try to find a company nearby which uses the software in a production environment. Contact them, ask to visit, get an independent demo. From my experience (not based on TMS that time) most people will be more than happy to tell you how much effort it took to setup, how many features still don’t work, but also how much their productivity has really increased and perhaps even how many of their employees have done a thesis on the subject! Bottom line: get real-life advice! 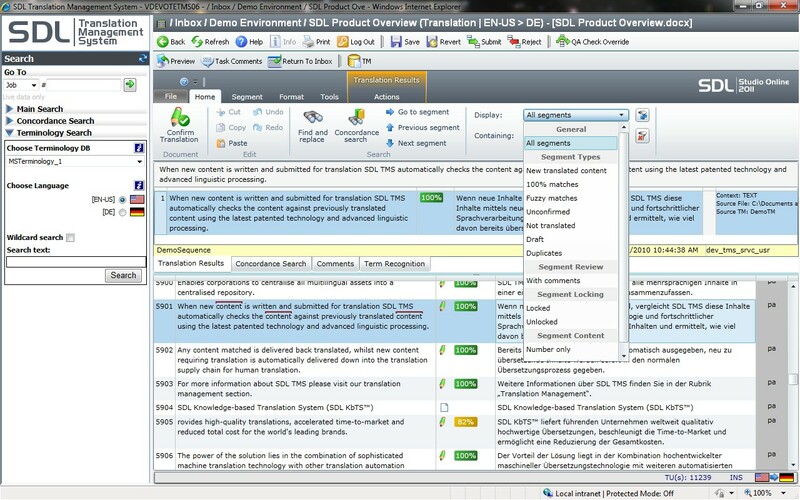 SDL TMS, or Translation Management System, is one such behemoth application. Trying to find independent information about TMS on the web is a challenge. In fact, even finding official information can prove frustrating. As for Special Interest Groups… those I found were for customers-only. It seems it’s buy first, we’ll talk later. So what’s the big deal exactly? Well I’ve been working with TMS 2007 for about a year now and I have a few things to report: some good, some not so good. Let’s start with positive thoughts. TMS is a workflow tool, designed to connect a customer directly to it localisation vendors and all their armies of sub vendors. It handles big volumes and short turnarounds really well, and is reasonably good at supporting your Translation Memory and Terminology Management needs. It also offers the reporting facilities necessary for all members of your localisation ecosystem to invoice each other, and you. TMS automates part of the role of the middle men, and is ideal for localisation consumers with a constant stream of translation, especially if they come in the shape of numerous small projects. Multiple alternative workflows can be set up, depending on vendor selection, TMs to leverage against, TMs to update, need for Linguistic Review etc. Once the correct workflow is selected at the job creation stage, you can be sure it will go through all the steps required. There is little or no human error possible, at least not in scheduling and assigning tasks to the right participant. TM updates are handled automatically, literally seconds after the last human input in the workflow. So are all the vendors really gathering orderly around the assembly line and localising thereafter like a happy family? Not exactly. There are a few snags. My main grief is around TM Maintenance or the lack of it. Because TMS automatically updates the Translation Memories at whatever stage of your workflow you told it to, manual editing of the TMs has been neglected. A user can perform a Concordance search, but it is impossible to edit the Translation Units found. One cannot use TMS to fix inherited inconsistencies or any error found in legacy TUs. increasingly, the business model in Localisation is outsourcing. once localisation is outsourced to agencies, these subcontract Single Language Vendors, who themselves might only be sub-contracting to freelancers. less and less Localisation consumers employ in-house linguists. their remaining in-country staff is Sales and Marketing, and has much more pressing matters to attend than editing TMs. Now which version are these freelancers more likely to have? SDLX 2007 Professional (€2,995) or SDLX 2007 Freelance (€760)? I think you probably guessed it. SDL’s licensing model prevents linguists from maintaining TMs in TMS and seemingly forces corporations which bought TMS to support their outsourcing setup, to fix TMs in-house! There are some workarounds to this, but for a piece of software of this caliber, I think this is a pretty shocking limitation. The integration with MultiTerm has similar issues: only some of the functionality are available through TMS, the rest including editing Term entries has to be done using MultiTerm Online or Desktop. Performance issues also tend to drive a lot of linguists offline! Depending on their setup, a lot of them find it more efficient to download jobs, translate offline in SDLX and upload the finished work back into TMS. While there is technically no difference in the end result, this is a disappointing interruption of the workflow. Service Pack 4: An End to the Suffering? Squeezing under the gate at the last second, like Bruce Willis in a classic movie, TMS 2007 Service Pack 4 sneaks in before the long-awaited SDL TMS 2010 and comes to the rescue. TM import: ITD, zipped ITDs, MDB (SDLX TMs). This is a partial solution to the lack of TM Maintenance feature I’ve talked about in this article. Continued lack of support for TMX is attributed to the fact that this open-source format has too many proprietary specifications. Reporting formats added: CSV, Excel 2007, PDF, RTF, Word 2007. Branding and Fonts are customisable (by Professional Services). TMS 2010 is expected to have end-user customisable reports. This all-new feature in SP4 is crucial if your workflow includes Linguistic Review. All changes made by the Reviewers are now recorded, and the Reviewers can tag them using customisable Error Rating and Categories. Error Ratings and Categories: support for LISA model, SAE J2450, TMS classic out-of-the-box. User-specific models can be created. Number of points deducted can also be specified in the QA Model. To apply a QA Model: add it to a Configuration (i.e workflow), and it will be available to Reviewers working on jobs passed through this config. Reviewer usage: click Star at segment level to open the QA model window and enter Category and Rating.Pass/Fail status does not prevent reviewer from submitting or rejecting a job. One by one, SDL continue to address obstacles to our upgrade decisions. Earlier today, one of their webinars tackled the critical topic of Compatibility in Translation Supply Chain. A recording will be available at www.sdl.com, but here is a quick summary for our convenience. This feature is not included in the recent release of SDL Trados Studio 2009. It is planned as an upcoming update, but until then SDL Trados WinAlign or SDL Align from the Trados 2007 Suite must be installed to perform alignment work. Once the alignment performed in Trados 2007, export to Translator’s Workbench TXT, and import into a Workbench or SDL Maintain TM respectively. That TM can then be upgraded to a Trados Studio 2009 TM (.sdltm). The export can also be imported directly into an sdltm but with implications regarding TM settings (see section below). Old TMs and bilingual files can be upgraded (File and Server-based supported). TMX can be imported directly into sdltm, but if imported into tmw or mdb first, the TM settings can be imported into the sdltm. 3rd party TMX may not support this path fully, as they may contain settings specific to the CAT tool used to create them. The Upgrade Translation Memories wizard in Trados Studio 2009 can batch process various TM formats for various language pairs simultaneously. A Custom option lets you rename the TM output files if required. Segmentation rules can also be imported. Translation Units can be filtered out by field (e.g. you can choose not to include TU’s tagged as “Not approved”). You can also choose to output as many as TMs as you input, or merge same language pairs independently of their TM formats. Export to TMX ensures vendors and colleagues who are using Trados 2007 can use your TMs. But this removes support for features like Context Match because information on previous segment, style…is only carried in sdltm. Importing ttx or itd directly into sdltm (batch) allows Context information to be added (this process however will not carry over any TM setting). It’s a case of either or. MultiTerm 2007 Termbase can be opened directly and automatically upgraded by MultiTerm Desktop 2009 (it’s one-time operation obviously). TRADOStag Document to save as ttx (requires SDL Trados 2007 Suite). into the new File type setting you created. Compatibility with SDL TMS will be implemented, as soon as integration is available. The date is unconfirmed and SDL advise to stick to SDL Trados 2007 Suite TM, Bilingual and TermBase formats for the time being. Compatibility with MultiTerm Online will only occur with the upcoming release of MultiTerm Server 2009.